An operating system can be defined as the computer software that allows the user to execute basic tasks such as file management, handling input and output, controlling devices such as printer and disk drives. However, Students often find it difficult to execute assignments related to operating system and its related concepts. It is quite a complex concept as it contains a lot of terminologies such as time, memory, and processors and hence requires professional assistance from experts. EssayCorp offers the best operating system assignment help to all students so that they can achieve better grades in academics. Our experts cover each and every concept of the operating system that is always asked by the tutor in the examination. The concept of the operating system is a discipline of computer science that describes all the information related to the internal working of the process and resources. The definition of the term states that it is an interface between the hardware and software. An operating system is a collection of programs that control the application software that users run and provides a link between the hardware and software currently running on the computer. It is also responsible for managing and controlling the multiple resources like memory, monitor, hard drives, etc. All these resources are meant to be shared amongst the different application programs that may be running simultaneously. Some examples of operating systems are Linux, UNIX, MS windows, Mac OS, and much more. Without being pretentious, EssayCorp renders an excellent operating system assignment help to the students. Our team of professional experts have an in-depth knowledge of operating system and its concepts that will help the students to achieve their dream grades. By describing each and every topic in the perfect manner with examples is the proper way of executing the assignment. Our experts make sure that our students get the completed assignment before the deadline. Not only this, there are also other effective offers and discounts on the assignment so that students don't feel any burden on their pocket. So, do not miss the chance to get high grades, just contact us and relax. 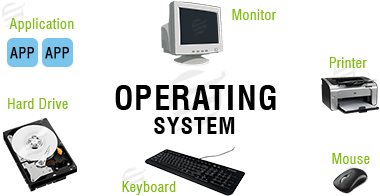 Batch Operating System: In this type of system, there is no direct interaction between the user and the computer. This is treated as the oldest type, as in this user was required to submit all the process of the same type in a batch. Multiprogramming Batch Operating System: In multiprogramming batch system, operating system and central processing system always get busy in executing the multiple jobs. Once job needs an I/O operation, this OS switches to another job. Multiprocessor Operating System: This type of system consists of several processors which share a common physical memory. It increases the speed of computing performance as several processors operate under a single operating system. Real-time Operating System: It is an operating system, which gives maximum time for each of the critical operations despite any buffering delays. Concurrency: It is used to manage multiple tasks that execute at the same time and share resources. It mainly includes context switching, synchronization, scheduling, deadlock and processes, and threads. Processes: Processes are the group of commands that are given to execute a program. A process has a virtual address space, open handles to system objects, a security context, a unique process identifier, environment variables, a priority class, minimum and maximum working set sizes, executable codes and one execution thread. Thread: A thread is a chain of commands within a process that is generally in order for execution. Threads also have their own security codes for protection or for keeping it safe. Threads are allocated to dispense their virtual space and system resources. Each thread also keeps a scheduling priority, exception handlers, thread local storage, a unique thread identifier, and a set of structures that the system will utilize up till scheduled or set. Memory Management: It is a process that is used to control computer memory and offers set of services such as dynamic address translation, virtual memory, linking, dynamic memory allocation and demand paging. File Systems: It is a method of organizing and storing the information on a computer hard drive. It covers several topics such as storage devices, disk management and scheduling, directories, protection, and crash recovery. UNIX: It is one of the leading operating system, which is used to organize and control the computer system and its peripherals. It is similar to Microsoft windows that offer a user-friendly environment. Linux: Just like other operating systems such as Windows 7, XP, and Mac OS, it is also an operating system that receives requests from programs and passes them to the computer's hardware. Microsoft Windows: It is the most popular operating system that offers a user-friendly interface by providing graphical display and also helps in collecting data and information. GUI: Also known as graphical user interface, it is an operating system that acts as an interface for the users so that they can interact with other electronic devices such as computers, laptops, and other hand-held appliances. Mac OS: It is a computer operating system that is widely used in various personal computers and workstation. Its advanced version, Mac OS X comes up with some 3-D appearance characteristics and new features that make it easier for the user to operate it efficiently. Understanding the concept of an operating system takes time. To write an assignment takes time as well. And if you want to score good grades, you need help. That's where we come in. We have provided many students with assignments that have helped them score better than they expected. We have experienced writers in the USA, Australia & Britain that offer the top quality operating system assignment help. They have the knowledge that will help them write what is needed to be written. This will help you score good grades. Scroll up to submit your assignment.